To save you time in searching for the latest, most reliable online marketing benchmarks, our digital marketing statistics compilation gives you a single source of the latest and most reliable sources to help you compare your investments in digital channels and your performance against others. The guide is aimed at helping anyone who needs to make the case for more or different investment in digital marketing by presenting to colleagues or clients (if you work for an agency or as a consultant) . The guide format is PowerPoint slides - to enable you to easily add charts to your presentations without wasting time looking for the very latest good, quality freely available insights. It contains nearly 100 slides from the highest quality benchmarking sources available. Search engines – the popularity of natural and paid search and consumer behaviour and the impact of search engines on purchase. Voice search and digital assistants. Which regions and countries are covered by the report? Our premium members are based worldwide, in more than 100 countries, so we want to help connect you with the most relevant data for your local markets wherever you are. However, the majority of consumer panels and published research on digital, mobile, e-commerce and social media adoption focuses on English-speaking markets in the United States and United Kingdom plus Europe. Australia, Canada, New Zealand, Asia Pacific, The Middle East (West Asia), Africa and South America tend to be less well served by consumer panels and reports, but we English-language reports on these where they have good quality data. We also reference more detailed global reports referencing individual countries. Our digital marketing statistics – adoption and usage compilation template gives you a single source of the latest and most reliable sources of online statistics to save you the time of looking through poor quality sources and infographics. What information is included for each chart? Format: Powerpoint slides – to enable you to easily add charts to your presentations. 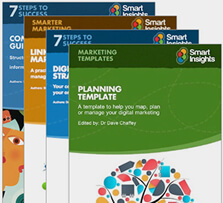 Includes over 100 charts structured by channel and with country/regional adoption.